Seattle — The Inland Empire, Seattle and Tacoma-Olympia Sections of the American Society of Civil Engineers (ASCE) released the 2019 Washington Infrastructure Report Card, giving nine categories of infrastructure an overall grade of “C,” which is the same grade Washington State (State) received in 2013. Washington civil engineers examined the state’s aviation, bridges, dams, drinking water, roads, schools, stormwater, transit and wastewater. The last Washington Infrastructure Report Card was released in 2013. Washington State population continues to increase — with Seattle surging as the fastest-growing city in the country since 2010. Seattle continues to also lead the nation in transit ridership growth, which increased by 4.7 percent from 2015 to 2016. A record 122.2 million riders used transit in 2017. Bridges (C+), roads (C-), schools (C+) and transit (C-) all had grade increases since 2013, indicating the State is preparing for its future. 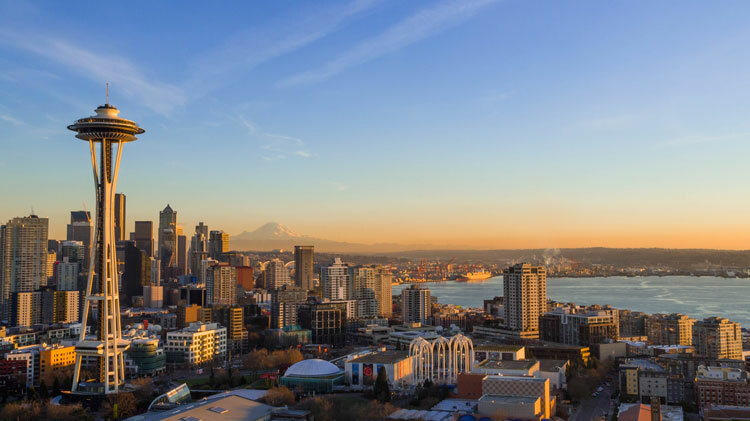 The Washington State Department of Transportation (WSDOT) has prioritized preventative maintenance activities and tackled several large-scale transportation projects in the Seattle region in the past five years. One reason Washington bridges are seeing improvement is because of the 2016 Connecting Washington 11.9-cent gas tax increase, which provided funding to address the most critical needs for bridges and removed weight restrictions on many structurally deficient bridges. Additionally, the State’s roadways are improving with 92 percent of WSDOT’s pavements in fair and better condition, which exceeds the state’s goal of 90 percent. Dams, holding the highest grade in the report of a “B-” decreased slightly from a “B” in 2013. The average life expectancy of a dam is about 50 years and over 40 percent of Washington’s dams are at or beyond that age. The State’s dams are aging and have had consistent funding challenges for the past four years. Two added categories were stormwater, which is runoff that originates from precipitation events and received a “D+,” and wastewater, which received a “C-.” Much of the state’s stormwater infrastructure is beyond its design life and in need of repair or replacement. Wastewater and stormwater were previously collected and treated as combined sewage to remove water quickly, whether it be from a home or from runoff during a rain storm. However, this practice resulted in combined sewer overflows, which are sewer systems that accept wastewater from buildings and stormwater runoff from streets in the same pipes, and deterioration to the natural environment. Separating stormwater and wastewater will prevent these issues, and King County is already working on a $262 million treatment plan to handle large combined sewer flows in the Duwamish River basin, resulting in treatment of a great deal of polluted stormwater. The State is home to 7,410 vehicular bridges. Of these, 321 bridges are in poor condition, which equates to 6.6 percent of the inventory based on bridge deck area. The Puget Sound region is experiencing the largest annual population increase in the nation and annual vehicle delay along major Washington highways increased by up to 173 percent between 2014 and 2016. Based on the 2015 Drinking Water Infrastructure Needs Survey and Assessment, Washington will need approximately $11.73 billion (2015 dollars) over the next 20 years to keep up with the growing demand and aging transmission, distribution, treatment and storage facilities to be able to safely and efficiently deliver water. The encroachment of incompatible land uses poses a serious threat to Washington’s airports by reducing their capabilities and compromising the public’s investment in airport infrastructure. The State is one of the country’s leaders in innovative and sustainable methods for managing stormwater as its own, separate resource from wastewater. These methods help support Washington’s commercial fishing and ecotourism economies, valued at $2.5 billion annually and almost 29,000 jobs that rely on having good water quality in our natural waterways. Leverage sustainable loan programs to finance necessary infrastructure projects in the State, particularly by financing from the Public Works Trust Fund, which must be used for its intended purpose of modernizing infrastructure. Improve funding sources for ongoing operations and maintenance of dams. Specifically, create low interest loan programs to assist private dam owners with needed repairs and maintenance. Demonstrate better accountability by making asset management and safety program information available and easily accessible to the public. Ensure drinking water rates provide for the full cost of service including operation, maintenance and capital improvements. Be the lead in environmental sustainability and resilience to natural disasters, by investing in green stormwater infrastructure to protect fish and wildlife in Puget Sound and to prepare for risks from extreme events, such as a Cascadia Subduction Zone earthquake or other natural disaster. The report determined the following infrastructure category grades: aviation (C), bridges (C+), dams (B-), drinking water (C-), roads (C-), schools (C+), stormwater (D+), transit (C-) and wastewater (C-). The Washington Report Card was created as a public service to Washington residents and policymakers to inform them of the infrastructure challenges and needs in their community. Civil engineers used their expertise and school report card letter grades to condense complicated data into a readable analysis of Washington’s infrastructure network. ASCE State Infrastructure Report Cards are modeled after the national Infrastructure Report Card, which gave America’s infrastructure a grade of “D+” in 2017. A full copy of the 2019 Washington Infrastructure Report Card is available at www.InfrastructureReportCard.org/Washington.